Tel: (2) 188 5100. Fax: (2) 916 2487. The Uruguay Carnaval has a strong oral tradition of generation to generation, of remembering –toasting familiar celebrations, great amigos– old music and stories. Rambla of Montevideo is the coastal/beach boulevard of the city, nearly 20 km length, bordering a chain of white sand beaches called the Rio de Plata. Tabladas, both stationary and mobile are erected throughout the city by the district councils. Often a small admission is charged. Jan 1: New Year’s Day. May 18: Battle of Las Piedras. Jun 19: Birth of General Artigas. Aug 25: National Independence Day. Oct 12: Discovery of America. Nov 2: All Souls’ Day. Uruguay has a population of 3.4 million and 2004 GDP of US$ 49 billion. approximately 40% of the country's population. Carnival Week is considered the annual national festival of the nation. While the Carnaval extends to all the country with important events in several cities of the interior, the main activities are made in the capital of Montevideo. The official launching of the Montevideo Carnival done with significant pomp and ceremony calling upon representatives of the national government, carnaval groups, and various local officials including members of the commissions responsible for the preparation of the celebration in each Zone of Montevideo. The Department of Culture is the main organizer of this annual national festival. 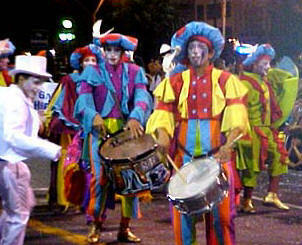 A great highlight of the Montevideo Carnaval is the Parade of the Calls in the old districts Sur and Palermo. The Calls evoke the encounter of the "enslaved black" of the colonial days and in the freedom of the Candombe, which has made a fundamental contribution to Uruguayan culture. A featured event of Montevideo Carnaval, the attracts the most visitors "Desfile de las Llamadas" is a big united parade on Montevideo's Avenida 18 de Julio.The 'black' carnaval is called "Las Llamadas" ("The Calls", because in former times the different carnaval groups "called" each other with their tambors). Many seats are sold in advance for this parade. The local commissions are very important in making the Carnaval great each year. Besides establishing a citizen partnership for the administration of the Carnaval with local government, they hold the Queen contest and raise funds for prizes and other expenses of the Carnaval. The decentralized quality to the Carnaval is part of the long heritage of these citizens committees dedicated to improving the quality of life of the neighbors and, fundamentally, deepening the democracy. Candombe is the afro-black influence that is the star of Montevideo Carnaval as it salutes the African origins, the trials of the enslaved black during the colonial time and the great capacity for renewal through the Carnaval arts. Candombé is a drum-based musical form of Uruguay. Candombé originated among the Afro-Uruguayan population of Montevideo and is based on Bantu African drumming with some European influence and touches of Tango. Today there are 80 or 90 comparsas in existence. Candombé is still performed regularly in the streets of Montevideo's central neighborhoods on Sunday evenings as well as on many other occasions, and massively on January 6, December 25 and January 1. During Uruguay's Carnival period, all the comparsas participate in a massive Carnival parade called llamadas ("calls") and vie against each other in official competitions in the Teatro de Verano theatre. In llamadas, comparsas often have costumes which reflect the music´s historical roots in the slave trade, such as sun hats and black face-paint. The monetary prizes are modest; more important aspects include enjoyment, the fostering of a sense of pride and the winning of respect from peers. The barrel-shaped drums, or tambores, have specific names according to their size and function: chico (small, high timbre, marks the tempo), repique (medium, improvisation) and piano (large, low timbre, melody). An even larger drum, called bajo or bombo (very large, very low timbre, accent on the fourth beat), was once common but is now declining in use. Tambores are made of wood with animal skins that are rope-tuned or fire-tuned minutes before the performance. They are worn at the waist with the aid of a shoulder strap called tali and played with one stick and one hand. The only inhabitants of Uruguay before European colonization of the area were the Charrua Indians, a small tribe driven south by the Guaraní Indians of Paraguay. The Spanish arrived in the territory of present-day Uruguay in 1516, but the Indians' fierce resistance to conquest, combined with the absence of gold and silver, limited settlement in the region during the 16th and 17th centuries. The Spanish introduced cattle, which became a source of wealth in the region. Spanish colonization increased as Spain sought to limit Portugal's expansion of Brazil's frontiers. Montevideo was founded by the Spanish governor of Buenos Aires in 1726 to secure the area against Portuguese infiltration from Brazil. It changed hands frequently during the Spanish-Portuguese rivalry of the early 19th century, until, partly through British intervention, it became the capital of independent Uruguay, established in 1828 as a buffer state between Spanish Argentina and Portuguese Brazil.